A report by independent analysts at Imperial College London has found that Scotland-based Gravitricity’s gravity-fed energy storage system may offer a better long-term cost of energy storage than batteries or other alternatives – particularly in grid balancing and rapid frequency response services. Both Charlie Blair, Managing Director of Gravitricity and Miles Franklin, Lead Engineer, are graduates of the College. The report states Gravitricity's first-of-a-kind 4MW prototype system could prove to be cheaper than batteries on a levelized cost of storage basis. he modeling emphasizes the importance of long life and lack of degredation for revenue stacking. The company states its technology is ideally suited to network-constrained users and operators, distribution networks and major power users. The technology operates in the 1MW to 20 MW power range and enables existing grid infrastructure to go further in a renewable energy world. The company’s patented technology is based on a simple principle: raising and lowering a heavy weight to store energy. In practice, it has similar advantages to pumped storage for networks up to 33kV, without the need for a nearby mountain with a lake or loch at the top. The key requirement is a deep hole in the ground; it can be a disused mineshaft brought back into use, or a purpose-sunk shaft. Shaft depths can be from 150m for new shafts down to 1500m for existing mines. The biggest single cost is the hole, and initially the company will test the technology using existing mine shafts. The company currently has plans to deploy a 250kW concept demonstrator working with Dutch company, Huisman. 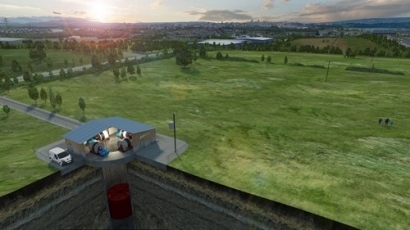 Gravitricity's aim is to trial its first full-scale prototype in 2019 or 2020 at a disused mine in the UK. The weight recycle system is the best energy storage technology to be deployed in disused mineshaft.We have a decentralized hydro technology that is quite suitable for mineshafts this is known as PRESSWELL HYDRAULIC PISTON ENGINE.Globex Resource & Energy would to solicit a collaboration with Gravitricity with this technology.